Director Kemi Adetiba is one of Nigeria’s experimental auteurs. That much was made clear from the scene that played out at the Sunday night premiere of her hotly anticipated King of Boys. The version that screened to a crowd of industry people- most seeing the film for the first time- came in at over three hours.. Directors will always be sensitive about their art but the realities of film distribution and making film have a way of checking such excesses. Not so for Ms Adetiba. For her first feature length, she was hired to direct the box office breaking The Wedding Party, a by-the-numbers romantic comedy that became a critical success but failed to reach shift the needle creatively. Before that, she had made her name as a top tier music video director, helming interesting but quotidian visuals for the likes of Banky W, Wizkid and Sound Sultan. King of Boys which Adetiba also wrote, may be her sophomore outing as a director, but it is the first film she’s made in her own voice. So what kind of filmmaker is Kemi Adetiba? It is hard to tell. Even after three hours. While this may be construed as a worrying sign, King of Boys at least proves that Adetiba is a hardworking director. Together with her production designer, Adetiba commits to the process of giving her film a distinct visual look. The film paints a picture of modern Lagos, where shiny high rise complexes exist alongside extreme poverty. King of Boys recognizes the fluidity of both worlds and their propensity to collide in the same physical space and Adetiba is up to the challenge of depicting these extremes in vivid color. King of Boys opens with a lavish birthday celebration, Lagos owambe style, complete with a cameo musical performance by Fuji veteran, K1 De Ultimate. The film’s protagonist, a powerful Lagos politician, Alhaja Eniola Salami (Sola Sobowale) is celebrating her birthday and as is expected, gives a great party to celebrate. The scene is important in that it introduces the character at the center of King of Boys. Adetiba and Sobowale first worked together in The Wedding Party and the chemistry between them, palpable throughout Sobowale’s scene-stealing performance from the first film, is transferred easily to King of Boys. Sobowale as Alhaja Salami walks majestically into focus, king (Oba) of the Lagos underworld scene that she is, with her heir apparent, Kemi (Adesua Etomi-Wellington, also returning from The Wedding Party) trailing her like a shadow. Both women benefit from the grandness of the wardrobe unit. The team works extra hard to drape them in colorful costumes tailor made for both anatomy and character. As far as Lagos is concerned, Eniola Salami knows where all the bodies are buried. She has commissioned a few of the hits herself but has cleaned up good for her birthday as she attempts to reconnect with respectable society. This opening scene establishes all these, but it quickly overstays its welcome as it drags unnecessarily, eventually moving to a shocking display of violence that barely adds an extra dimension to Eniola Salami’s character. This habit of not knowing when to quit trails King of Boys, as it shows up in scenes that are either redundant or overstay their welcome. For all of her efforts in enthroning her political party’s candidates in elected government positions, Eniola expects to be compensated with a top appointment at national level and this gathering is also a show of power, her declaration of intent. Not to mention an image laundering activity as Eniola attempts to reinvent herself as a successful business woman with friends in high places. Mogul by day, mob boss by night. Meaty roles such as this, written for women of a certain age, characters with full and interesting lives that do not revolve around husbands or children are still a Nollywood rarity. Sola Sobowale who has spent her post-The Wedding Party career doing unexciting iterations of the same role bites into this plum gig with gusto. Perhaps too much gusto as she delivers a performance that is unhinged and deliriously over the top. Adetiba is a willing accomplice. As an actress, Ms Sobowale is the physical embodiment of the theatre actress, constantly projecting with her voice and body language to ensure even the people in the cheap seats get as much bang for their buck. It is a hard trait to shake off, even when HD cameras allow you carrying a world of meaning in an eyebrow twitch. King of Boys presents her with the opportunity indulge these quirks, sometimes all in a hot minute. And can you blame her? Eniola Salami is King Lear, faced with the burden of dividing her spoils between her two children. She is Don Vito Corleone but without the fear inducing restraint captured by Marlon Brando, and in scenes of her younger years, she is Toyin Tomato with the sauce. Or is it called stew these days? It is a great role that Adetiba has envisioned, one made for attracting awards attention but neither Sobowale nor her director never fully commit to the subtlety needed to make this character entirely believable. The post-election promise does not quite materialize and the Salami empire is shaken to the core, as Eniola finds herself fighting not just for her political future, but for the survival of everything she holds dear. While her attention is divided, a disgruntled underling, Makanaki- (rapper Reminisce, debuting with an explosive screen presence)- spots a chance to execute a coup. He kick starts a rivalry that must end in a bloody gang war. 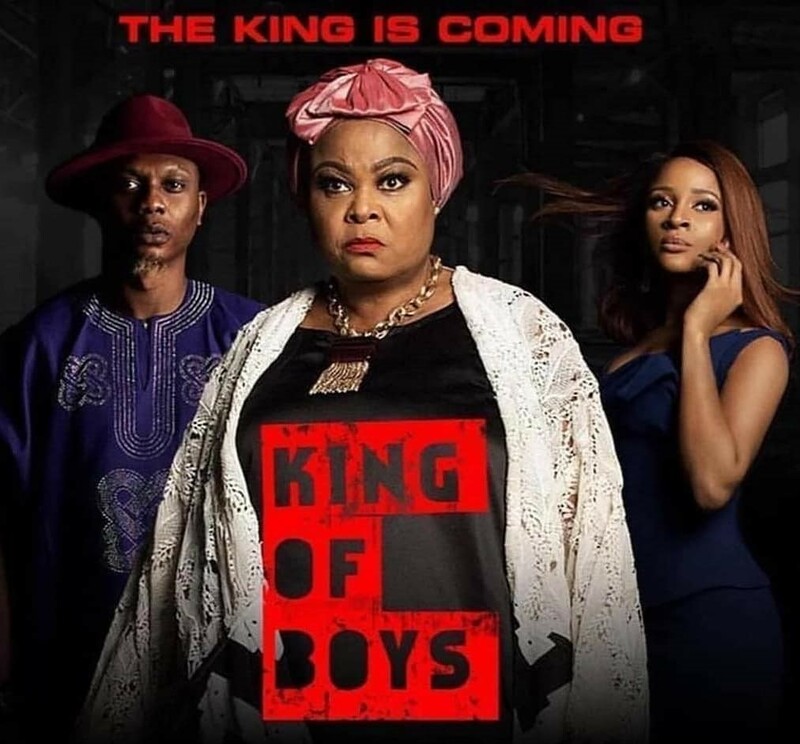 Reminiscent of ‘’old Nollywood,’’ King of Boys is manna for those who think Nollywood hasn’t been about a thing since the likes of Teco Benson and Chico Ejiro stopped racking them up by the numbers. Hugely plot driven, the story is thrilling and moves with a bang as the twists and turns come tumbling in. The themes are plenty- power, greed, vengeance, feminism- but corruption pretty much sums things up nicely. Corruption in high and low places, in business, in politics, society and in personal relationships. King of Boys is ultimately a character study on chronic and insidious corruption. The film details via the arc of the protagonist, the ways that innocence is lost and observes how evil begins to seep into people’s lives, acting in a positive feedback mechanism to foul up everything it comes in contact with. Victims birth even more victims and the cycle repeats itself. It is an interesting concept worth exploring but Adetiba’s screenplay struggles to find the patience to truly grapple with ideas highlighted. Instead she relies on the tired tropes of high drama and visual spectacle to make up for the deficiencies. The scenes of violence when they appear, seem gratuitous. There is too much color, too much screaming and so much happening we are never allowed to wallow in the true cost of each act of violence and each death. A sequence where a character breaks into a building- and the burning house scene that follows- is visually exciting but ultimately inert in relation to the rest of the film. Speaking of color, scenes clash so loudly as if two separate cameras were used to shoot at some point and no one figured out how to synchronize them. It is a fine set of actors that Adetiba assembles and she gets some credible performances out of them. It is almost impossible to look away from Reminisce in particular who is tailor made for the role of Makanaki. It is a one-dimensional role but Reminisce enlivens it by sheer force of presence and could have been even better if only he had lines worthy of his presence. Toni Tones seems a tad overwhelmed as she makes her way through the meatiest role of her acting career so far. If any actor comes out strongest, it is Paul Sambo as Gobir, the financial operative hot on the trail of Alhaja Salami. King of Boys is Alhaja Salami’s film, but it is Gobir’s as well as he finds himself on a journey to self in his pursuit of Salami. Gobir’s arc isn’t terribly original but Sambo plays him with a sensitivity that stands at odds with all the hysteria around him. A lot about King of Boys is on the nose, even in places where subtext would have served better. And also, we need answers to why the film is so long. Perhaps it references those times when it was fashionable for Nollywood films to arrive in multiple parts or maybe it was an idea for which the metaphors simply doesn’t exist. But that is what makes ‘King Of Boys’ so fascinating. It shows that Kemi Adetiba is the kind of auteur to forgo box office success in lieu of true cinematic progress. And in an industry so sorely crippled by for-profit film, Adetiba’s ambition is refreshing.